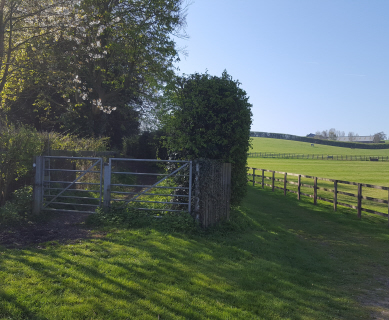 This is a semi-urban walk for those who do not want to venture over muddy fields in the winter, or who might want to explore the north end of Bishop’s Stortford. 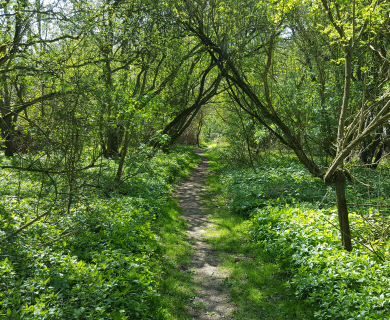 In the spring there will be a host of bluebells and wood anemones visible from the new path through Birchanger Wood. Surface: Roads, tracks, urban footpaths. Obstacles: Tall flight of steps over railway footbridge. A bit sticky underfoot in a few places. Starting from the river bridge cross the Causeway Link Road at the pedestrian crossing and follow the road round to the right past Waitrose and the Y.M.C.A. At the zebra crossing cross over to enter Half Acres by the phone box. This little lane is enclosed by brick and flint walls, those on the left once bounded the grounds of the old Chantry. The ruin visible at the entrance to Monks Walk was an imported ornamental relic. Over the top of the hill follow the narrow path between hedges. Just before the kissing gate go up the steps to the left and wind up through Carrigans to reach Chantry Road. Turn left and after a 100 yards or so right into Pleasant Road. Note the Beehive on the face of the house about 40 yards along. At the end of the road follow the Footpath no. 46 signposts to Cricketfield Lane, turning right at the garage for 32A. When you reach Cricketfield Lane turn right and cross to the footpath through the gates erected in memory of Tresham Gilbey. This was one of the entrances to Whitehall which you follow through the cricket fields and into what was once a glorious driveway through rhododendron bushes and an avenue of lime trees. On the way up the drive you get a view of the ancient mound by the spring in the hollow of the fields over to the left. At the top of the drive you reach Dane O’Coys Road where you turn right, passing some new houses in the grounds of Whitehall. Across the field on the left is another mound. Not so ancient, this is an air raid shelter for Whitehall.There used to be two, presumably one for the staff and one for the family. A little further on from an opening off the road you can take in a far-reaching view across Farnham, Hazel End, Stansted and Birchanger. Follow the road straight on into a stony track where daffodils will soon be giving a good display. At the bottom of the slope bear left and follow the lane. Turn right at the blue building which used to be a dairy and is now two dwellings. One of these is named Barkers after Sir John Barker, founder of Barker’s of Kensington, who once lived at the Grange behind the wall opposite. Going down to a main road, Rye Street, cross over and go left for about 200 yards and then turn right into Cannons Mill Lane. You come to a level crossing and just before that a path to the right would lead you back along the river to the start if you want to shorten the walk. We cross over the railway and soon over the River Stort.Off to the right is where Parsonage mill once stood, now gone almost without trace. A few yards over the bridge turn left by River House into John’s Road and then bear right along Footpath 61 to reach Stansted Road. Proceed to the left along this road, crossing over at some point. Opposite Gates Ford Dealers and just before the bus stop go up some steps to the right to enter the Wickes car park. Follow the yellow marked route which leads to a narrow alley to the right of the outdoor section, and this will emerge to cross a small stream into Birchanger Wood. Ahead is a new surfaced walkway which you follow for nearly a mile through the woods which in the spring will be carpeted with bluebells and wood anemones. To take the direct route through the wood keep to the path which winds up the right hand side of the wood. Any of the surfaced paths branching off to the left will take you on a circuit through the wood and will eventually rejoin the main path. 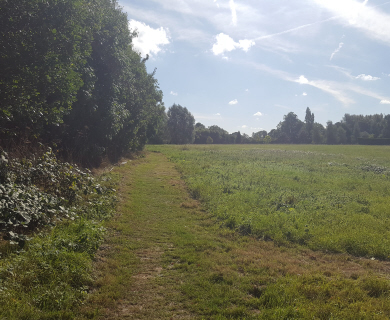 At the very top corner of the wood the walkway leads onto Footpath 48 and this takes you by Birchwood School to Parsonage Lane. Turn right and follow Parsonage lane down for about half a mile, past Church Manor, and then enter the small park on the left. Footpath 56 is indicated crossing the park. Bear right and go down nearly to the bottom of the field and look for the exit through a gap in the hedge with a concrete post in the middle. Follow this path round garages, across a road and round corners to reach Stansted Road. Cross over, turn left and go into Cherry Gardens on the right. After 100 yards turn left into Kingsbridge Road. About 200 yards along you will see a footpath going off to the right. 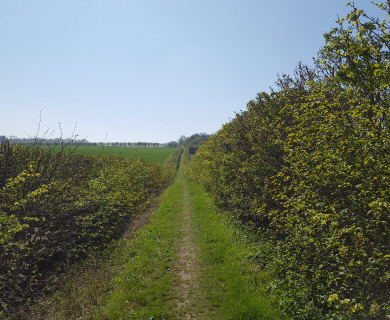 This path will take you down behind the houses to a bridge under the old Dunmow railway line. Go under the bridge and up over the main line and on the far side the path ahead leads through the play area back to where you started. 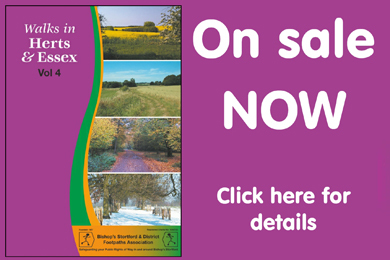 This is a lovely walk exploring the north of Bishops Stortford. We did it a few weeks ago and saw the best of the bluebells in Birchanger Woods but I’m sure there will be other wonders to see throughout the year. We also did the route in reverse which I wouldn’t recommend as it is hard to follow the description in reverse. Just a few comments to update the description. The building works mentioned in Dane O’Coys road have now become some very smart looking houses. Nice to have a nose as you walk by! The Focus Do-It-All has now become Wickes. Finally the paths through Bichanger woods all look to be newly upgraded so good underfoot even after heavy rain. Great site and will be looking to enjoy more of the walks in the future.